The Bohras are a one million strong community with its diaspora all over the world. It is one of the few Islamic sects to be led by a leader, who is called the "dai". 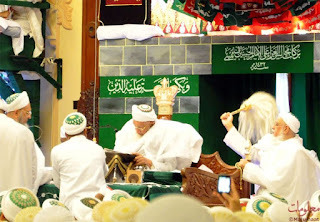 The present dai is Syedna Mohammad Burhanuddin, and he is over 95 years old. Old age, illnesses and infirmity have curtailed his mobility significantly. During the month of Muharram, which Shia muslims observe to commemorate the martyrdom of Imam Husein A.S., the dai selects a particular city or town where he stays for 10-12 days to preach a daily sermon to his devout followers. Read the book shown alongside to understand the story of the martyrdom of Imam Husein A.S. This year, our dai chose to stay in Mumbai for the entire duration of 10 days, and will extend his stay to shower his blessings on Mumbai's Bohras for a longer time as well. The locality of Mumbai that becomes the center of attention is called Bhendi Bazaar. This is because this is the place where the tomb of the previous dai, Syedna Taher Saifuddin, the father of the present dai, is located; so also, right opposite this tomb is the biggest mosque of the Bohras, the Saifee Masjid, where the dai presides to give the sermons. These sermons are linked by internet and other modern technologies to not just the important mosques and congregation centers of Mumbai, and not just to similar structures all over India, but also to all similar centers to all the parts of the world. Thus, a Bohra sitting in a mosque in, say, Andheri, will see the same images and so on as one who is located in San Francisco, California, or elsewhere. Now, don't get me wrong. 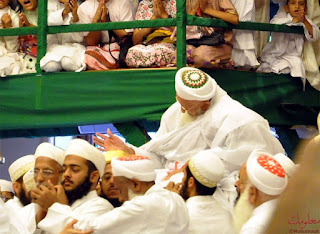 I am NOT a devout Bohra, and although I admire the systematic structure of my community, I do not love its leech-like tendency to extort money from its members, and I certainly don't endorse the fanaticism of the members who have elevated the dai to a station that is higher than where it is meant to be. I can understand it, I just cannot endorse it. So be it. 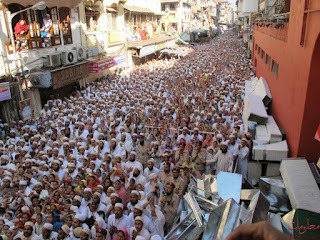 Now, this year will go down as the mother of all the years that I have seen Muharram, for the people who came down to observe the Muharram in Mumbai was easily over a hundred thousand, and the community's administration arranged stay, food, and all other means of hispitality for all of them. The response, as they say, was phenomenal. I have appended a few pictures of the Syedna, and his faithful followers below. Do take a look. Going on to the next big festival, Noel, or Christmas. It is around the corner, and shopping and other forms of activity is picking up as it nears. Yesterday, Hannah, my younger daughter, attended a prom function organised by the cultural dept of her college (read "seniors"). She went dressed in a violet frock that looked stunning on her. I will try and post a photo of the same if possible.